Srikalahasti is a town situated near Tirupati in the state of Andhra Pradesh, India. It is a temple town and mainly known for its numerous temples. Devotees visiting Tirupati, a famous pilgrimage center, also halt at Srikalahasti. It is located on the banks of Swarnamukhi. It is also famous for the temple of Shiva located there. It is believed that the name Srikalahasti is made up of three words Sri, Kala and Hasti which mean Spider, Serpent and elephant respectively. Some Legendary tales are associated with it and they narrate how these three animals got redemption with their great devotion to lord Shiva. 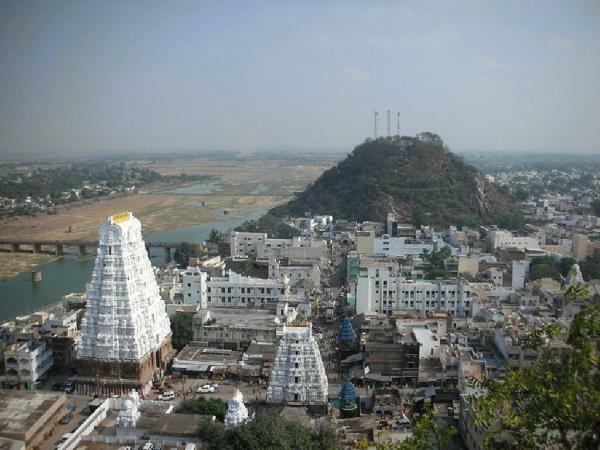 There are many temples in and around the town of Srikalahasti. Srikalahastiva temple in Srikalahasti is known as Kailash of the South. This ancient temple is devoted to lord Shiva. Durgambika temple is another place of worship in Srikalahasti. This ancient temple is devoted to Goddess Durgambika and is surrounded by beautiful nature. The temple is visited by both devotees and tourists. Bharadwaja Theertham is another place of religious and tourist attraction near Srikalahasti. It is situated near the beautiful stream of water. It houses a beautiful idol of Vinayaka. Bhakt Kannapa temple and Chaturmukeshwara temple are some of many other temples to be seen in and around the Srikalahasti. Temperature of Srikalahasti varies from 30 to 43 degree Celsius in summer while it remains 21 to 32 degree Celsius in winter. October to march is the best time to visit the place. Srikalahasti is well connected by rail and road to other parts and the state and the country. Srikalahasti railway station is well connected to other major cities of south India. Many state run buses and other private vehicle are available from many cities and towns of the state. Tirupati is just 60km away from Srikalahasti and serves as nearest airbase to it. Tirupati is well connected by many flights to other major cities of the state and the country.